When a big part of your day relies on cleaning various surfaces, then a commercial pressure washer is a worthwhile investment. What can be achieved with a pressure washer in a short amount of time is equal to hours of backbreaking work with soap and a hosepipe. If you are in need of a new pressure washer then it is worth spending some time considering which will be the best commercial pressure washer for you. Commercial pressure washers are not a cheap product but making a good choice when purchasing will save you a lot of money in the long run, and the product should last you a number of years to boot. A commercial pressure washer can be used to clean a variety of outdoor surfaces, patios, decking, windows, walls, boats and other outdoor surfaces. Some can even strip paint or remove graffiti. If you are involved in construction, landscape gardening, you own a garage or you do any other kind of messy practical work, owning a commercial pressure washer can be imperative to cleaning up efficiently at the end of a job. "Gallons per minute" (GPM) indicate how much water will be flowing from the pressure washer. The greater the GPM the faster and better the machine will clean. If you will be using the pressure washer for heavy duty work for a considerable number of hours, the higher the GPM rate the better. If you will be using the machine regularly but not necessarily on a daily basis you can afford to use a machine with a lower GPM rate. This is the measurement of the pressure of the water as it exits the hose. There are other factors such as nozzle size that affect the pressure; however, any commercial pressure washer should have at least 3,000 PSI. For any really heavy duty sustained work then a PSI of at least 4,000 is best. This gives an overall picture of the power and capability of the machine. The GPM and PSI rates are multiplied and the resulting figure is the CP. This can help when comparing machines by taking into account both the GPM and PSI. The engine is an important part of the machine and the power of the engine will drive all the working parts. The majority of commercial pressure washers will have an engine of 190 ccs (cubic centimeters). The engine is an important part of the machine and it is worthwhile investing in a quality brand with a well-made product because then the product will last. Many products will come with features that help to protect the engine from overuse. For example, they may shut down when the oil gets too low, or have thermal sensors to help detect and prevent overheating. When choosing the best machine for your needs you can bear in mind your budget and balance your budget with the power and intensity of the work you need to do with the product/ engine power etc. 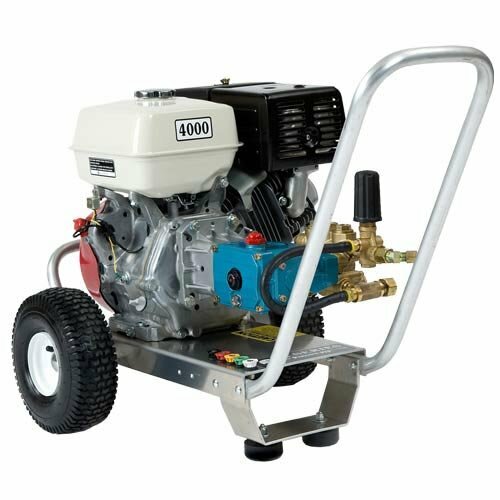 There are three kinds of pumps that can be fitted into a commercial pressure washer. • The wobble pump which is the cheapest option, but will not last the longest. • The axial cam pump, this is supplied in mid-range pressure washers. The pump will last longer than a wobble pump but not as long as a Triplex plunger pump. • Lastly, the most expensive machines are equipped with a Triplex plunger pump. These will last the longest and can take the most intense use. In the end, you have to balance out your budget and the amount you need to use the machine. If you will be using the machine on a daily basis for, a protracted number of hours there is no point buying a cheaper model, you need to invest in the high-end products. However, if you will not be using the machine on a daily basis for long periods of time you can get away with the mid-range axial cam pump or even the wobble pump for low use. Commercial pressure washers can be fitted with other kinds of features which can improve the strength of the machine and its uses. • Different kinds of hoses – A 3/8-inch hose is standard for commercial pressure washers. • Wheel-mounted with "never flat tires"
• Will shut down if the oil gets too low. • High-end price and will not suit every budget. The Generac pressure washer is a strong product with a high PSI of 3,800. This means the pressure washer will pack a hefty punch and tackle even the most resistant dirt. The strongest type of pump (Triplex) is included and ensures the product will last. The frame and build of the product look sturdy and I like the way the engine and working parts are protected inside the frame. This is a very useful feature to have in a busy construction/ garage or landscaping environment when there is always some risk of damage being sustained to the machine. It is not necessary to spend this much if you are not planning to use the pressure washer daily or for regular heavy use. However, if you will need the washer regularly for big jobs it is a worthwhile investment. This is a high-end heavy duty product with a strong pump and high PSI. However, the price is very reasonable really, given what you are getting for your dollars. • A range of nozzles provided. A heavy duty professional pressure washer made up from brands you can rely on. The engine is Honda and the Triplex Pump made by CAT. They state the engine is carb compliant so this makes the product a good choice for people who are conscientious about the environment. There are other helpful features to protect the engine such as a filter to prevent dirt reaching inside. The 4,000 PSI will make sure you leave any surface you clean gleaming! This is a high-quality product and if you have the budget and have need of a heavy-duty machine for your work this should be a reliable purchase to make. The PSI of this unit is 3,100, which could be a little low for commercial purposes. However, if you are on a budget and you will not be putting your pressure washer through too much sustained heavy duty use then the product could be a good option for you. Purchasing a product with a slightly lower-end PSI is a good way to reduce the money you are spending. Consider carefully though because the lower PSI also means the unit may not be suitable for sustained, daily use. If you only need the unit every now and then, or a few times a week then save some money and this will be a good choice. After all, the unit will still be vastly superior to electric pressure washers for home use only. The unit is Carb compliant so this is a bonus for people who care about the environment. The included hose is also a high quality and kink resistant. If you are tackling dirt, grime and mildew in your work then this unit can handle the job with ease and the product will make a good choice. • 2 Year Limited Consumer Warranty | PUMP - 1 Year Limited Warranty | FRAME - 5 Year Limited Warranty. • Uses an Axial Cam pump. This pump will have a shorter lifespan than a Triplex but is reflected in the price. From the five products I have chosen, this is the most powerful of them all. The 4,200 PSI will put superior cleaning power in your hands. 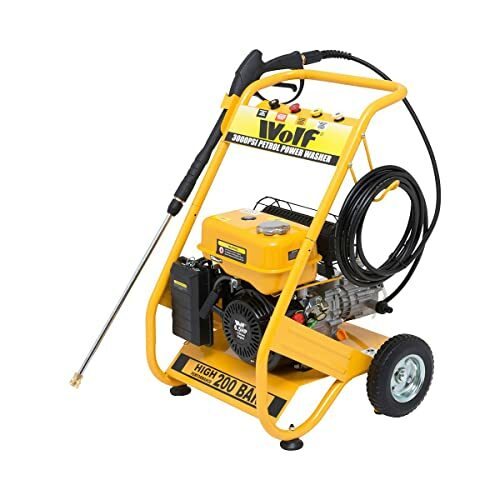 For those of you wanting a heavy-duty pressure washer that can tackle graffiti removal or other similar heavy-duty cleaning jobs then this pressure washer will make an excellent investment. The unit uses the best quality Triplex Pump (made by CAT) and other high-quality elements like a strong Honda engine and an aircraft grade aluminum frame. As the largest model Simpson offer, the product has some handy extra features such as a detergent injection hose, and a sensor to detect if the oil is too low. 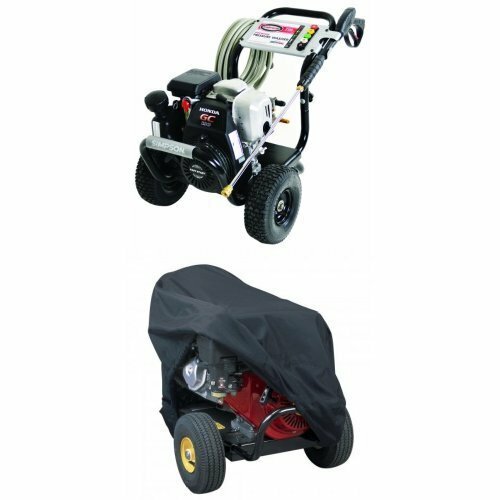 If you need a powerful pressure washer that you will use daily and for sustained cleaning jobs then this will be an excellent choice. • Sturdy tires to support the machinery. • The machine may not be suitable for very heavy duty commercial use. Rather suitable for low to medium commercial use. 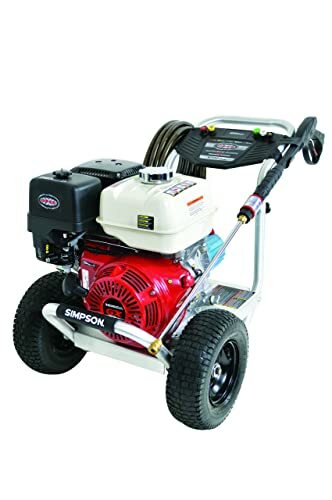 This sturdy looking pressure washer comes with 3,000 psi which could be a bit low for a commercial pressure washer. However, the machine has a number of useful features. For example, the machine shuts down if the oil gets too low; this protects the machine from sustaining damage when in use. In addition, the product has a very competitive price. As long as you don't need a machine to work all day every day on very heavy-duty cleaning jobs this machine will make a good choice. The five products I have chosen for you above are all high-quality powerful pressure hoses. You cannot go far wrong with any of them. Now it is up to you does decide the level of your need, balanced with your budget and see which one will suit you best. 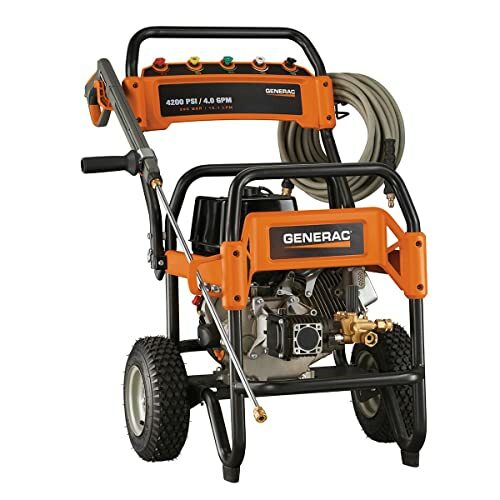 My favorite has to be #1: Generac 3,800 PSI because I like the frame's design. Or #4: Simpson 4,200 PSI for its unparalleled power. What are your thoughts? Do you have one of these products? How have you found using it? What is the most stubborn dirt you have been able to remove with your pressure washer? Let us know in the comments! Previous Post Best Carpet Cleaner 2019 To Choose For Your Home Next Post Best Double Din Head Unit 2019: In Easy Language for Average Joe.